Many mobiles not only entertain at wedding receptions, but they also provide sound reinforcement for ceremonies. While the number of options for music player/controller, mixer, mics and speakers are seemingly infinite -– we’ve narrowed them down a bit for you to help make the choices for your wedding ceremony rig a bit easier. To keep it simple, I’m going to divide your audio options into two categories: All-in-one portable public address systems, and individual components based on personal preference. Here are some of the more popular portable PA systems from which you can choose. Brendan Lafferty: The Rolls RM74 Party Mix Mate II mixer, Bose L1 Compact speakers, Sennheiser lavalier mics, Vocopro wireless handheld mics. I use Virtual DJ‘s keyboard shortcuts to run the whole thing on a laptop. For really small jobs, I’ll skip the laptop and use the Tonium Pacemaker. Gregg Hollmann: A B-52 Prodigy workstation. It is an all-in-one mixer and dual-CD/MP3 player that sets up very quickly. Mark Taylor: A Numark CDMIX2 that I keep in a Marathon case. It is a combination dual CD player and mixer with auxiliary and mic inputs. The unit also serves as my backup mixer and CD player. It is a very portable and durable piece of gear. Frederick Hart: Yorkville self-powered speakers with an i-Pod plugged in, and Sennheiser wireless handheld mics and lavaliere. Denny McConnell: 1 to 2 Mackie Powered SRM-450 speakers, Virtual DJ, a Pioneer DJM0500 Mixer, Gemini Wireless handheld mics, and several one to two terabyte external hard drives. 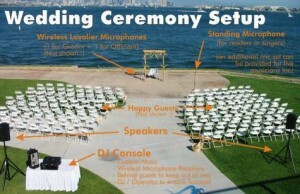 Robert Lindquist: For ceremonies, check out VocoPros UHF-5800 wireless system. It contains 4 wireless handheld mics with a single, rack-mountable receiver. You can either connect each mic separately (4 ins and 4 outs) or the common output to a single mixer input. I’m currently working on a full review for L2Pnet.com but the initial impression is very positive. Depending on how you mount them, you should be able to mic the bride, groom and officiant to not only provide PA, but also for a digital recording of the ceremony. 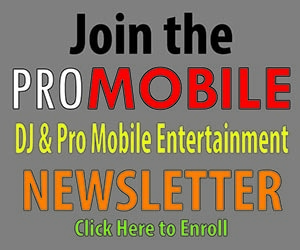 Great places to visit for additional information on DJ gear of all kinds are djchat.com and mobilebeat forums. What’s in your wedding ceremony rig?